Along the world third longest Yangtze River, there are many hub cities and ports, with Chongqing and Yichang being the major hub cities to start and end your Yangtze River cruise. Here we will show you how to get to those cities from other popular destinations in China and transportations to get to the right cruise port to board on your cruise ship to start your lifetime cruise holiday on the Yangtze. Let’s go! Chongqing, on the upper reaches of the Yangtze River, is the starting port of a downstream cruise and the ending terminal of an upstream sailing. As Chongqing is a large prosperous city, the very complete traffic network will make your way to and from this city very easy. Major popular cities, such as Beijing, Shanghai, Xian, Guangzhou, Hangzhou, Shenzhen, Guiyang, Kunming, Lhasa, Harbin, Nanjing, Changsha, Zhengzhou, Lanzhou, Sanya, etc. are connected with Chongqing with frequent daily flights. Hong Kong (many daily flights), Macao (several daily flights except Wednesday), Taipei (1-2 flights every day, 3hrs), Singapore (3-5 daily flights, 4.5hrs), Phuket (daily flights, 3.5hrs), Nha Trang (1 daily flight, 3hrs), etc. with direct flights to Chongqing also offer easy way to arrive in this city. To get to Chongqing city, you can take a train. And the following cities have some high speed G-trains and D-trains to this city, and they are: Bejing (12hrs), Shanghai (about 11hrs), Xian (about 5 hrs), Guangzhou (about 11.5hrs), Changsha (about 8.5hrs), Hangzhou (about 12.5hrs), Shenzhen (about 12hrs), Fuzhou (about 13hrs), Wuhan (about 6.5hrs), Zhengzhou (about 8.5hrs), etc. Moreover, since Chongqing is very close to Chengdu, it is convenient to get to Chongqing by the high speed train from Chengdu, for the frequent daily bullet trains take only 1.5~2 hours from the neighboring Chengdu city to Chongqing. Besides, if driving from Chengdu, it takes 2.5-3 hours through the Chengyu Ring Expressway, an expressway encircling the cities of Chongqing and Chengdu. How to get to Chongqing Port? Chongqing Chaotianmen Port (朝天门码头) situated about only 4km to the city center is the only port for Yangtze River cruise in Chongqing. The port is formed by 13 subdividing docks, and specific ships use at different docks based on the arrangement. And according to the related official regulations, the specific dock number of the ship is informed only 1 to 2 days prior to the departure date in Chongqing. Once we get the information, we will tell you about the dock number. To get to Chaotianmen Port, you will have many various choices of transportations, such as the local public buses, rail transit system, taxies, etc. You can take the Rail Transit Line 3 to Hongqihegou Station and transfer to the Rail Transit Line 6 to get off at Xiaoshizi Station, walk out from the Exit 7 and arrive at Chaotianmen Port after walking for about 1.4km. And if you’d like to take the taxi, it usually costs about 40 to 60 minutes covering about 27km. Besides taking the Rail Transit Line 3, Line 6 or Line 1 to get off at Xiaoshizi Station, you can also arrive at Chaotianmen Port from Chongqing North Railway Station by the local taxi, for about 30 minutes for about 12km. Many local buses connect Chongqing Railway Station with Chaotianmen Port. Besides, you can get on a taxi to easily get to the port terminal for only about 10 minutes with the short distance of about 6km. If you have any questions about how to get to Chongqing and Chongqing port, please feel free to contact our professional Travel Consultant for help! 4 Days & 3 Nights Chongqing Yichang Downstream Cruises, starting at Chongqing Chaotianmen Port, is operated by all Yangtze cruise ships, namely the Victoria Cruises, Century Cruises and President Cruises, Yangtze Gold Cruises, Changjiang Cruises and Yangtze Explorer. 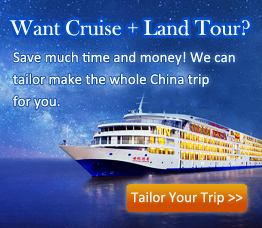 You can choose your ideal cruise ship to start your 4 days Yangtze River cruise tour. How to Get to Yichang? Yichang, where the middle and upper reaches of the Yangtze River are divided, is an important trading port and the “Gateway to the Three Gorges” for the 5 days upstream Yangtze River Cruises. If you are going to enjoy the cruise from Yichang, you can get to this city by air, train and coach from many other popular cities in China. Compared to Chongqing, Yichang offers a little fewer flights to domestic cities in China. However, Yichang Sanxia Airport also has opened air routes from major cities like Beijing, Shanghai, Xian, Guangzhou, Shenzhen, Nanjing, Xiamen, Kunming, etc. If your last destination is Shanghai, you can also take a daily bullet train from Shanghai to Yichang. There are many high speed bullet trains from Shanghai Hongqiao Railway Station to Yichang, and you can get to Yichang from Shanghai, Nanjing, and Hefei within 7 hours. Besides, you can also take high speed train to Yichang from Wuhan (about 2hrs), Chengdu (about 6.5hrs), Hangzhou (about 7.5hrs), Nanchang (about 5hrs), Zhengzhou (about 4hrs), etc. How to Get to Yichang Ports? 2019 Yichang Port Change News for Yangtze Cruises: in 2019, all Yangtze River Cruises would use Yichang Maoping Port for embarkation and disembarkation in Yichang (except Yangtze 1 using Yichang Sandouping Port). Yichang New Century Port is stopped using. Maoping Port located in Zigui County of Yichang City is about 50km from the downtown area, which takes about 1 to 1.5 hours by taking a taxi. However, cruise companies using Maoping Port would arrange tourist bus for Yangtze Cruise travellers to get to the port. So you need to gather together at Yichang downtown first, usually at Yichang Three Gorges Center Cruise Terminal (or called Yichang 9 Port) or Yichang East Railway Station, and then take the buses to Maoping Port for embarkation. So people of cruises docking at Maoping Port just need to get to the gathering place in Yichang downtown. (For visitors arriving in Yichang by train, we suggest you gather at Yichang East Railway Station directly, and for others by air, we suggest you choose to gather at Yichang Three Gorges Center Cruise Terminal that needs about 40-50 minutes driving from Yichang Sanxia Airport (about 30-35km away)). Note: (1). Address of Yichang Three Gorges Center Cruise Terminal (or called Yichang No. 9 Dock): No.142, Yanjiang Avenue, Wujiagang District, Yichang City (facing Yichang Wanda Plaza) 宜昌市伍家岗区沿江大道142号 - 宜昌三峡游客中心 (宜昌九码头). (2). Address of Yichang East Railway Station: Chengdong Avenue, Wujiagang District, Yichang City 湖北省宜昌市伍家岗区城东大道 - 宜昌东站. How to take the tourist bus? Among all the mainly used ports for Yangtze River cruises in Yichang, Sandouping Port is the closest port to the marvelous Three Gorges Dam, with a short driving distance for about 6.9km. The 5 days $ 4 nights Yangtze River upstream cruise starts from Yichang and ends in Chongqing, and is served by all the Yangtze River cruise ships, such as the very popular Century Cruises, Victoria Cruises, President Cruises, etc. Select your favorite cruise from all Yangtze River cruise ships to begin your China Yangtze River cruise trip! ● More time enjoying your trip, instead of wasting on finding your way. Or you can contact our experts for detailed transportation guide in the port city for your Yangtze cruise.